Time for a New Fence? Here’s What to Look For! 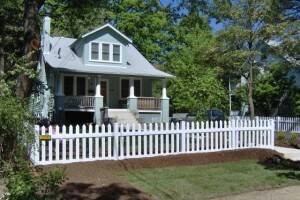 Ready for a new fence this season? Look out for these signs on your old one. If the winter wasn’t so kind to your fence and you’re concerned that you might need a new fence entirely, it can be difficult to gauge whether damage means a repair or total replacement. Here are our top tips for taking a walk around your fence to determine whether you need a repair or a new fence. Are the Security Measures Working? If your fence has a gate, locking mechanism, or any additional security features, are they operating correctly? If they aren’t doing their job, it might mean a simple repair or greasing the metal components, but it also might mean that the fence itself is having structural issues. If your gate is incredibly difficult to open and you find yourself struggling every morning, you are putting pressure on all of the fencing panels surrounding that area and potentially causing a big problem. A new fence might be needed if your security features aren’t doing their job. This question sounds a little bit silly, but where are your fence posts? Are they in the ground? If they aren’t, or are leaning against the posts around them, they aren’t doing their job. All it takes is one bad storm and those posts could become projectiles that do major damage to your home. If your fence is unstable, it might be time for a new fence instead of simply replacing the posts. The biggest reason that people need new fences is major damage. On wooden fences, this damage could look like rotting, deterioration, or insect infestation. On metal fences, this damage could look like major rust. Work with a professional from Hercules Fence to see how much damage there is and what can be done to fix it. This entry was posted on Friday, March 31st, 2017 at 7:00 pm. Both comments and pings are currently closed.